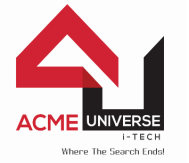 ACMEUNIVERSE i-TECH conducts classes in Mobile App Development, PHP and iPhone Programming. It is located in Porbandar Birla Sagar, Porbandar. It takes Regular Classes- at the Institute and Online Classes- via online medium.